A farmer asked an engineer, a physicist, and a mathematician to fence off the largest possible area of a field with the least amount of fence. The engineer made the fence in a circle and proclaimed that he had the most efficient design. The physicist made a long, straight line and proclaimed "We can assume the length is infinite..." and pointed out that fencing off half of the Earth was certainly a more efficient way to do it. The mathematician just laughed at them. He built a tiny fence around himself and said "I declare myself to be on the outside". What's the maths behind this joke? And finally, for anyone who's ever attended an undergraduate maths lecture, check out 36 Methods of Mathematical Proof. One of my favourite comics from the wonderful mind of Randall Monroe. Check out his other comics at www.xkcd.com. Abtruse Goose: Strip cartoon about math, science and geek culture. Foxtrot: FoxTrot is a comic strip centered around the chaotic Fox family with its three kids, two parents and a perpetually hungry pet iguana. 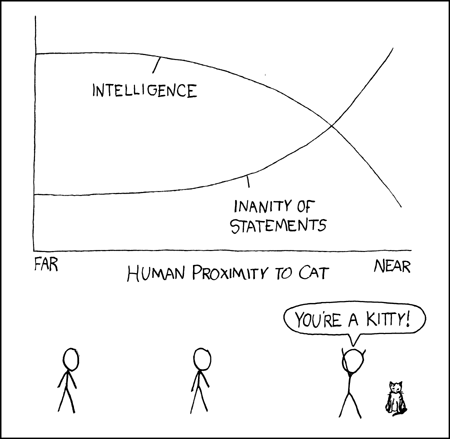 xkcd: Stick-figure strip featuring humour about technology, science, mathematics and relationships, by Randall Munroe. Disclaimer: I take no responsibility for content on external sites. Some of the sites listed above contain profanity. Browse with caution if you are offended by this sort of thing. Site descriptions taken from Google listings.